This tool kit has been updated to meet all of the EU's GDPR mandated requirement. 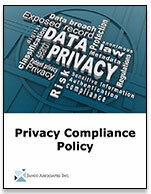 In addition, it now reflects all of the requirements of the newly enacted California Privacy Act and contains the Privacy Compliance Policy with its associated electronic forms and job descriptions. 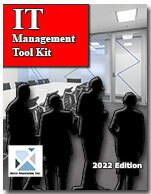 This toolkit bundle is a collection of the latest CIO's tools which have proven to be the most productive. 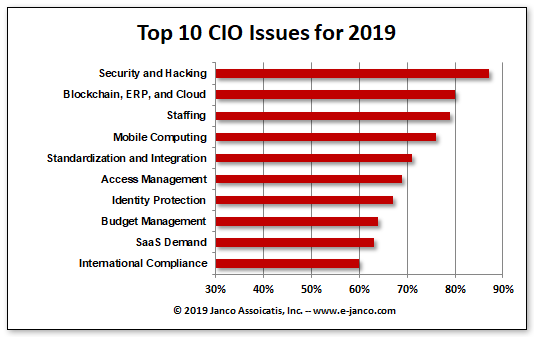 In a recent survey of CIO and C-Level executives Janco identified the top 10 issues that CIOs face and they relate to the three areas mentioned above. Blockchain, ERP, and Cloud Computing - This is the new hidden IT that is driving many new applications and is not under the complete control of the CIO and IT organization. Staffing - During the past few years that has not been an issue but now with an improved IT job market new staff needs to be added and at the same time staff turnover will increase. Mobile Computing - BYOD and mobile applications are where users are looking for support in order to improve their bottom line results. Standardization and Integration Infrastructure - No longer are those interacting with the data and systems in a single location utilizing standard hardware and software. Records management, retention, and destruction as well as version control are just a few of the areas that CIOs need to manage and control. Access Management - With the increase in access points to data and confidential enterprise assets there is a need for more enciphering and access protection. Identity Protection - With the availability of more information on individuals and enterprises there are more opportunities for bad actors to capture enough information that the can build profiles with can then be used in detriment to both individuals and enterprises. Budget Management - There are two ways to control budgets. First spending can be limited. Second productivity can be improved both within IT and the operational units of an enterprise. International Compliance - With the onset of new compliance requirements like GDPR for the EU more rules will have to be implemented with businesses which operate outside of the US. The kit can be ordered with or with out Janco's subscription update service or any of the kit components can be ordered individually.